Inspired by nature, engineered for performance. 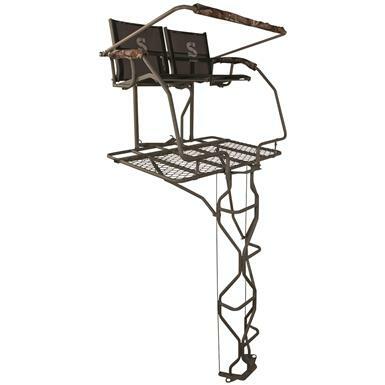 Featuring a ladder designed to mimic crawling vines, the Summit Vine Double Ladder Tree Stand breaks up straight lines and helps you stay concealed from cautious wildlife. This deluxe 2-man Tree Stand with large, weather-resistant mesh seat comes fully equipped with a built-in footrest, padded armrests, and padded shooting rail. Includes 2 full-body fall arrest harness systems and ratchet straps. Seat Dimensions: 18"w. x 16"d.
Weight Capacity: 2 people weighing 250 lbs. each / one person weighing 350 lbs.